Source: U.S. Bureau of the Census, “Poverty in the United States: 2002,” Current Population Reports, Series P60-222 and data published online at http://www.census.gov/hhes/www/poverty.html. The official poverty rate was 12.1 percent in 2002, an increase over the rate of 11.7 percent in 2001. Even so, the percentage of persons living in poverty in 2002 was below the poverty rates experienced in most of the 1980s and 1990s. Children under 18 had a poverty rate of 16.7 percent in 2002, statistically unchanged from 2001. As in past years, the child poverty rate is considerably higher than the overall poverty rate. The poverty rate for the elderly (persons ages 65 and over) was 10.4 percent in 2002, an increase over the 2001 rate. This was a lower poverty rate than the rate for children under 18 (16.7 percent) and statistically indistinguishable from that of adults ages 18-64. Poverty rates by race are affected by a change in the questionnaire that allows individuals to report one or more races. The poverty rate for individuals reporting black race alone was 24.1 percent, as shown in Table ECON 1; the rate for those reporting black alone or in combination with other races was 23.9 percent (data not shown). Under either measurement, the gap between black and white poverty rates was close to 14 percentage points, slightly higher than the historic low of 13 percentage points in 2000 and 2001; but significantly lower than the early 1990s, when it exceeded 21 percentage points. Notes: All persons under 18 include related children (own children, including stepchildren and adopted children, plus all other children in the household who are related to the householder by birth, marriage, or adoption), unrelated individuals under 18 (persons who are not living with any relatives), and householders or spouses under age 18. In this table, race categories include those of Hispanic ethnicity. Persons of Hispanic ethnicity may be of any race. Beginning in 2002, estimates for Whites and Blacks are for persons reporting a single-race only. Persons who reported more than one race are included in the total for all persons but are not shown under any race category. For example, the poverty rate of 10.2 percent shown for Whites in 2002 is for “White Alone including Hispanic.” Though not shown, the rate for “White Alone or in Combination with other races” was 10.3 percent and for “White Alone, Non-Hispanic” the rate was 8 percent. American Indians/Alaska Natives, Asians and Native Hawaiians/Other Pacific Islanders also are included in the total for all persons but are not shown separately, due to small sample size. Source: U.S. Bureau of the Census, “Poverty in the United States: 2002” Current Population Reports, Series P60-222 and unpublished tables available online at http://www.census.gov/hhes/www/poverty.html. The percentage of the population in “deep poverty” (with incomes below 50 percent of the federal poverty level) was 4.9 percent in 2002, compared to an overall poverty rate of 12.1 percent. In general, the percentage of the population with incomes below 50 percent of the poverty threshold has followed a pattern that reflects the trend in the overall poverty rate, as shown in Figure ECON 2. The percentage of people below 50 percent of poverty rose in the late 1970s and early 1980s, but then, after falling slightly, rose to a second peak in 1993. The overall poverty rate followed a somewhat similar pattern with more pronounced peaks and valleys. Over the past two decades, there has been an overall increase in the proportion of the poverty population in deep poverty. From a low of 28 percent of the poverty population in 1976, this population rose to nearly 41 percent in 2002. The total number of poor people in 2002 was 34.6 million, as shown in Table ECON 2. While higher than the previous year, this number was 4.7 million lower than the peak of 39.3 million in 1993. Source: U.S. Bureau of the Census, “Poverty in the United States: 2002,” Current Population Reports, Series P60-222, unpublished tables available online at http://www.census.gov/hhes/www/poverty.html, and 1970 Census of Population, Volume 1, Social and Economic Characteristics, Table 259. Source: Congressional Budget Office tabulations of March CPS data. 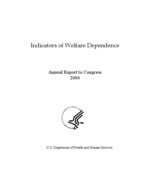 Additional calculations by U.S. Department of Health and Human Services. The official definition of poverty – which includes means-tested cash assistance (primarily TANF and SSI) in addition to pre-tax cash income and social insurance – was 12.1 percent in 2002, as shown in the bold line with empty boxes in Figure ECON 4. Without cash welfare, the 2002 poverty rate would be 12.8 percent, as shown by the top line in the figure above. Adding other non-cash, public assistance benefits to this definition has the effect of lowering the percentage of people who have incomes below the official poverty rate. Adding in the value of food and housing benefits reduces the poverty rate to 10.9 percent in 2002. When income is defined as including benefits from the Earned Income Tax Credit (EITC) and federal taxes, the percentage of the total population in poverty decreases to 10.0 percent in 2002. Taxes have had a net effect of reducing poverty rates since the significant increases in the size of the EITC in 1993 and 1995. The combined effect of means-tested cash assistance, food and housing benefits, EITC and taxes was to reduce the poverty rate in 2002 by 2.8 percentage points, as shown in Table ECON 4. Net reductions in poverty rates were somewhat lower during the recession of the early 1980s, and somewhat higher in the mid-1990s, largely due to expansions in the EITC. Note: The four measures of income are as follows: 1) “Cash Income plus All Social Insurance” is earnings and other private cash income, plus social security, workers’ compensation, and other social insurance programs. It does not include means-tested cash transfers; (2) “Plus Means-Tested Assistance” shows the official poverty rate, which takes into account means-tested assistance, primarily AFDC/TANF and SSI; (3) “Plus Food and Housing Benefits” shows how poverty would be lower if the cash value of food and housing benefits were counted as income; and (4); “Plus EITC and Federal Taxes” is the most comprehensive poverty rate shown. EITC refers to the refundable Earned Income Tax Credit, which is always a positive adjustment to income whereas Federal payroll and income taxes are a negative adjustment. The fungible value of Medicare and Medicaid is not included. Source: Unpublished data from the SIPP, 1993 and 1996 panels. About half of all poverty spells that began during the 1996 SIPP panel ended within four months, and 80 percent ended within one year. Only 11 percent of all such spells were longer than 20 months. Spells of poverty that began between 1993 and 1995 were slightly longer; 47 percent ended within four months and 16 percent were longer than 20 months. Poverty spells among adults age 65 and older were more likely to last longer than 20 months (17 percent) than spells among other age groups, as shown in Table ECON 5a. Source: Unpublished data from the SIPP, 1996 panel. Source: U.S. Department of Health and Human Services, Administration for Children and Families, Office of Child Support Enforcement, Child Support Collections: 2003 TANF Report to Congress (and earlier years), Washington, DC. Collections paid through the Child Support Enforcement system (Title IV-D of the Social Security Act) totaled $20.1 billion in 2002, over $1 billion more than in 2001. Since 1990, child support collections grew rapidly, at an average rate of almost $1.1 billion a year. In recent years, non-TANF collections have generally increased as a percentage of overall collections by the IV-D program. (Non-TANF collections include collections paid to former TANF families and families with no contact with the welfare system.) However, between 2001 and 2002, the $878 million growth in non-TANF collections was smaller in percentage terms than $302 million growth in TANF collections (5 percent compared to over 11 percent). A number of states have opted to pass through some or all of collections to the custodial TANF family, even though the 1996 welfare reform repealed the former requirement for a $50 “pass-through” to families. In recent years, the amount of TANF collections paid to TANF families has been difficult to track because of changes in data reporting forms. Available data suggest these payments declined in fiscal years 1997-2000, with a 100 percent increase shown in fiscal year 2001 and a 122 percent increase in 2002, as shown in Table ECON 6. Almost 75 percent of TANF collections (collections on behalf of TANF recipients and for past due support assigned to the state by former TANF recipients) were retained in 2002 to reimburse the state and federal governments for the cost of welfare benefits. Note: Not all states report current child support collections in all years. Constant dollar adjustments to the 2000 level were made using a CPI-U-X1 fiscal year average price index. Due to changes in data reporting forms, data for fiscal years 1999 and thereafter relating to the Federal and State Share of TANF collections include assistance reimbursement for former TANF families and may not be exactly comparable to that of previous years. The total collection of payments to AFDC/TANF families can also include payments made to Medicaid only recipients. Source: U.S. Department of Agriculture, Economic Research Service, Household Food Security in the United States, 2002. A large majority (89 percent) of American households was food secure in 2002 – that is, showed little or no evidence of concern about food supply or reduction in food intake. The prevalence of food insecurity with hunger in 2002 was estimated to be 3.5 percent. During the twelve months ending in December 2002, one or more members of these households experienced reduced food intake and hunger as a result of financial constraints. Food insecurity would be lower measured over a monthly basis. An additional 7.6 percent of households experienced food insecurity, but were without hunger, during the twelve months ending in December 2002. Although these households showed signs of food insecurity in their concerns and in adjustments to household food management, little or no reduction in food intake was reported. Poor households have a higher rate of food insecurity with hunger (14.3 percent) than the 3.5 percent rate among the general population, as shown in Table ECON 7a. Only 1.5 percent of families with incomes at or above 185 percent of the poverty level showed evidence of food insecurity with hunger. Poor persons were twice as likely as all persons to be without health insurance in 2002 (30 percent compared to 15 percent). While the ratio varied across categories, persons with family income at or below the poverty line were more likely to be without health insurance regardless of race/ethnicity, gender, educational attainment, or age. Hispanics were the ethnic group least likely to have health insurance in 2002, among both the general population and those with incomes below the poverty line. While white individuals in general were more likely to have insurance than black individuals, poor black individuals were more likely to have insurance than poor white individuals. Among all persons, the amount of education was inversely related to health insurance coverage. However, among poor persons, educational attainment made little difference as to whether individuals had health insurance. As shown in Table ECON 8, nearly half of poor people ages 25 to 34 are without health insurance. Among the general population, individuals ages 18 to 24 are the most likely to be without health insurance. Note: "Poor persons" are defined as those with total family incomes at or below the poverty rate. Race categories include those of Hispanic ethnicity. Persons of Hispanic ethnicity may be of any race. Beginning in 2002, estimates for Whites and Blacks are for persons reporting a single-race only. Persons who reported more than one race, such as “White and Asian,” are included in the total for all persons but are not shown under any race category. Due to small sample size, American Indians/Alaska Natives, Asians and Native Hawaiians/Other Pacific Islanders also are included in the total for all persons but are not shown separately.